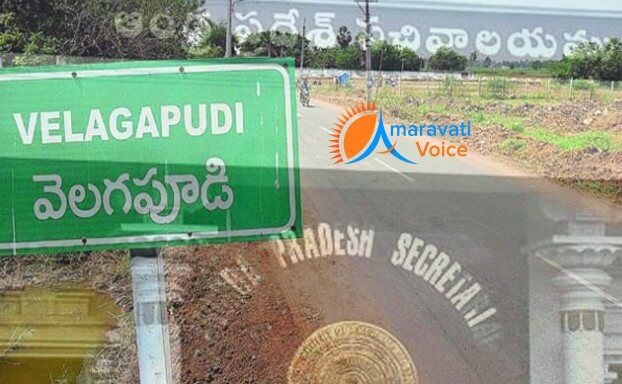 Andhra Pradesh government that temporary Secretariat comes up at Velagapudi village in Mangalagiri mandal of Guntur district. Velagapudi is close to the core capital area comprising the villages of Uddandarayunipalem, Vengayapalem and Tallayapalem. Velagapudi is about 15 km from Vijayawada. The structure will come up on the survey numbers 205, 206, 207, 208 and 214 spread over 26 acres. The complex will have a built-up area of about six lakh square feet and will house all state-level government offices. The state government also called for tenders for the two-storeyed complex. The government invited tenders for temporary capital construction in three categories — pre-fabricated construction, RCC construction, and steel construction. The structure should be ready by June. The approximate cost of the whole project is 180 crores. Of this, Rs.90 crore would be loan from HUDCO and the remaining would be borne by the State government. Though right now they are constructing G+1, the designs are made so that in future, they can construct G+6. Each building will have two floors. The estimated time to contractor is, five to six months time to complete the complex. Contractors will get 21 days to participate in the bidding. After that, the tenders would be finalised within five days. Municipal Administration Minister P.Narayana said that permanent buildings housing the Secretariat, state assembly and Raj Bhavan will be constructed in the core capital area.